Ever since the Oculus Rift was revealed, I’ve been excited at the prospect of trying out virtual reality with the power of current technology. Virtual Boy, this is not. From running and gunning on an omni-directional treadmill with Team Fortress 2 to getting your virtual head decapitated in a Guillotine Simulator, the Oculus Rift has been used for a variety of ideas and it hasn’t even been released commercially to the public yet. 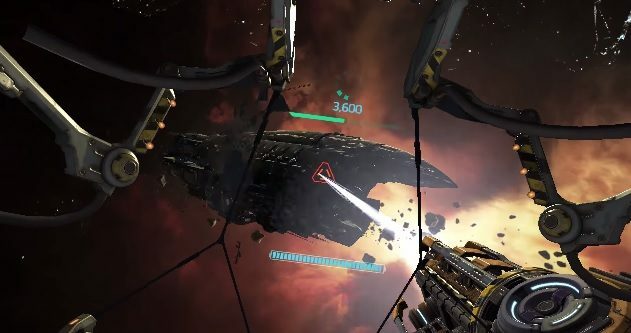 At E3 2013, I finally got my hands on one when demoing EVR (or EVE VR), the passion project of a small team of programmers and artists at CCP Games, the developers behind the legendary EVE universe. What was amazing was to see how unintrusive the experience was (at least for the ten minutes that I tried it out; I can’t comment on long durations of use). Even with the advent of small and more powerful technology, I expected the Oculus Rift to more accurately simulate Atlas holding up the sky with his neck than being a viable tool for gaming. Thankfully, I was pleasantly surprised at how light and comfortable it was for what it offered. The screens weren’t close enough to my eyes to feel like I was staring nose-pressed against a window at Christmas, and the lens was wide enough to capture the entirety of my view, so there was no “breaking the fourth wall” with accidental peaks out the corner of your eye. 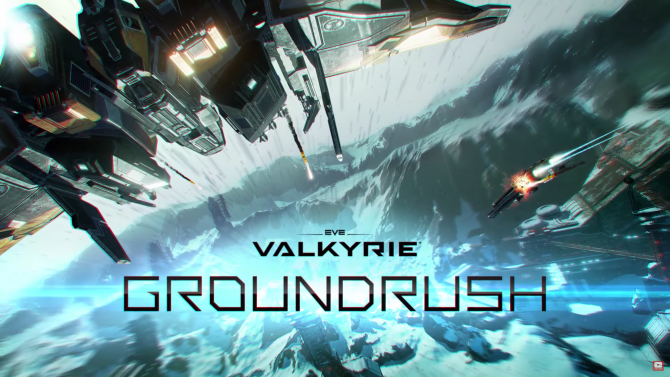 Keeping in in mind that the demo I played was just a prototype only weeks old and put together by small group (initially five, now about a dozen) in their spare time (when not working directly on EVE Online and Dust 514, 20% of CCP time is allotted to side-projects), there’s a lot to be impressed about. Experiencing three dimensional gaming from my own point of view while fighting in a space combat simulator is simply beyond words. You had me at “space,” CCP. The game starts off in a hangar as your character, a clone pilot in EVE‘s universe, waits to deploy. While the lettering that hovered before me wasn’t exactly sharp, everything else was amazing for a recently put-together build. 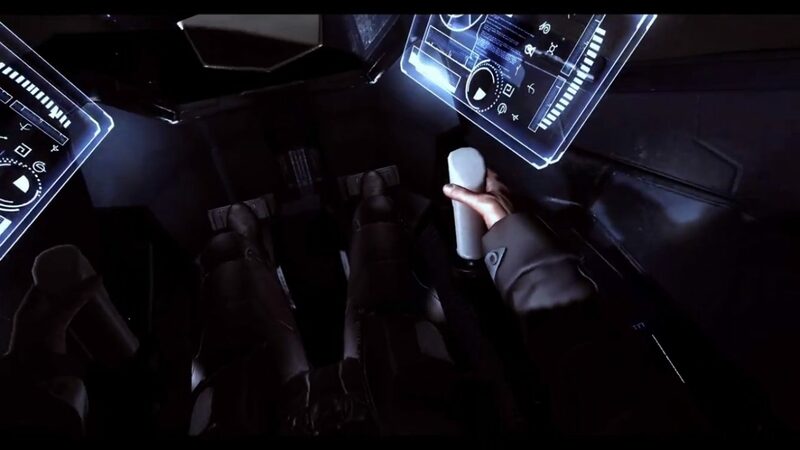 If I looked down while still in the hangar, a full virtual body stiffly took the place of my own, anatomically correct (with perhaps a few small deviations in size) and ready to be shot into space at a moment’s notice. If I looked anywhere around me in 360 degrees of view, I could see the entire interior of my ship: the nuts and bolts holding it all together, the weathered metal reinforcing the structure of the ship, and the glass that allowed me to peer into space. It was – if I may be allowed to stifle my excitement with a cliche – as if I were actually there. I have to take a moment to digress: I can only imagine the implications of VR technology with powerful motion controls, combining the visual perception of a world that can be manually manipulated with your own hands. Perhaps a game like Steel Battalion can fare better with a combined platform between the Oculus Rift and Kinect 2.0 or Move, with a complete virtual mecha that can be piloted accurately using the original notorious interface. When launched into space in EVR to wage war against my fellow Rift-users, a controller was indeed used to control movement and shooting. And, honestly, the controls were very simple. But being given the opportunity to drift through space and admire the scenery – asteroid rubble and what appeared to be the ruins of a space station – was enough to render me speechless. When it came to actually fighting against my foes, I had the option of unlimited laser blasts using the right shoulder button of my controller, or a special barrage of missiles. This attack was triggered by moving my head and hovering my sights over a target enemy, and then pressing the left shoulder button to unleash them once primed. This was a small but useful mechanic, where I could fire at one enemy with my ship’s cross-hairs while still aiming and firing with my eyes at another. By the end of the demo, I was by no means The Last Starfighter, but I was assured that having a score that wasn’t negative meant I did well. I’ll take that. There’s no clear indication that EVR will become anything more than a passion project or experiment: both art director Andrew Robinson and programmer Sugurdur G. Gunnarsson have said as much. For now it’s just a cool exploration into the possibilities of current and next-generation virtual reality, one that shows a lot of promise. Hopefully, one day, it can fulfill that promise and be more. And hopefully, it’s EVR.